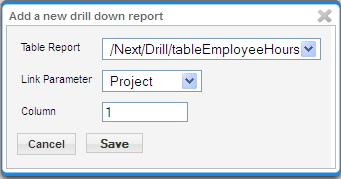 Starting from version 4.1, NextReports Server will be able to define drill down process for table reports. The number of levels to drill down is infinite. To link two table reports you need to have a link parameter and to specify the column position whose value will be pass to the next report in the drill process. All values from the column will be represented as links and the drill-down will happen just by clicking one of them. The path (shown as the first column in the drill-down reports) will be composed from all the values clicked by user.